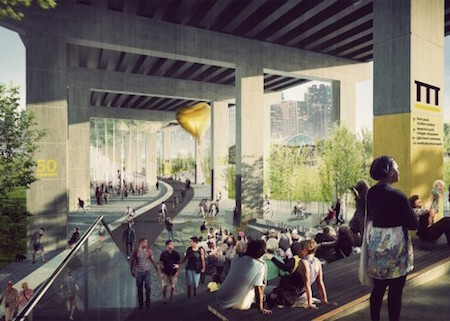 A unique and creative new park will soon be under construction in Toronto, Ontario. The intent is to make use of sheltered space underneath a raised roadway and transform it into a park for walking, cycling and outdoor performances. Existing columns and beams of the surrounding infrastructure will naturally divide the spaces into sections that act as exterior rooms while also providing ways to hang signage, wayfinding mechanisms and announcement billboards. The project is being launched with the help of a sizable $25,000,000 donation from Toronto philanthropists Judy and Wil Matthews. The modern transportation systems cleaned the air and made traffic jams archaic and left the nation with an embarrassing problem. What to do with ten thousand miles of unsightly abandoned freeways?